First off, I’d like to thank the great people at MEElectronics once again for the review samples. As the lower end entries in MEElectronics’ Clarity series, the CX21P and CW31 are designed to offer a different sound signature than what may be expected from the California-based company. 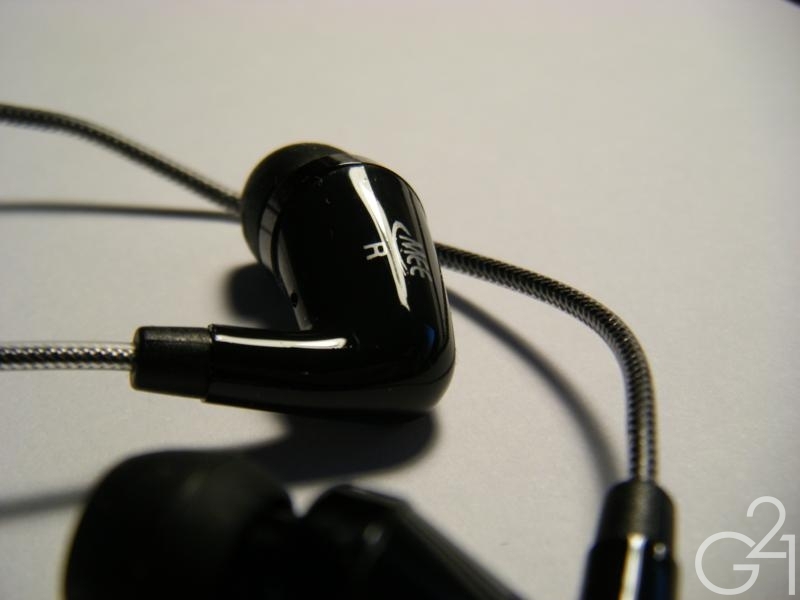 Erring on the side of neutrality and clarity, these earphones are designed to be a relatively inexpensive choice for users who are accustomed to clearer more analytical sound signatures. So, did MEElectronics live up to the promise of clarity and detail or did they fall short? The results of my testing are after the break. Packaging for both IEMs is fairly standard fare for MEElectronics and so is the accessory pack, which is to say that they’re both good. Interestingly, MEElectronics includes two accessories that are different from the standard. 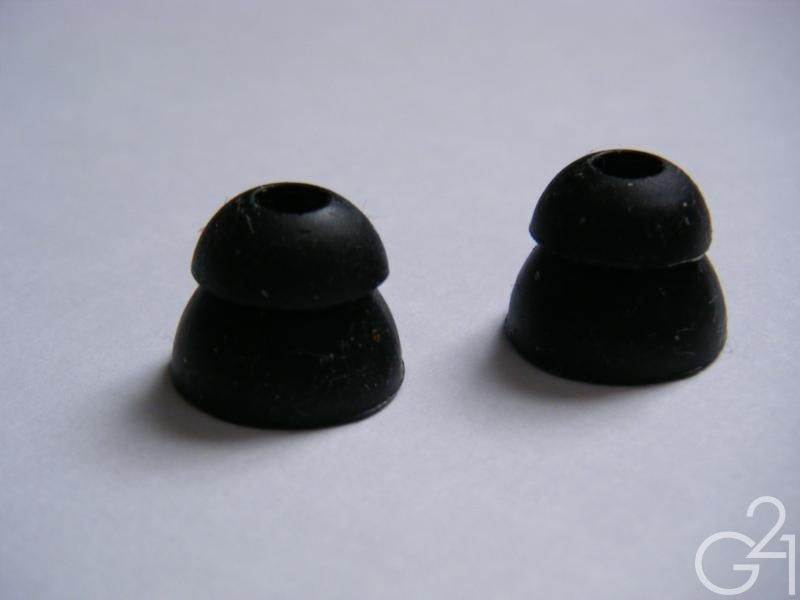 First up is a pair of small bi-flange tips which are smaller than the typical MEElectronics Bi-flange and is a great fit for my small ear canals. 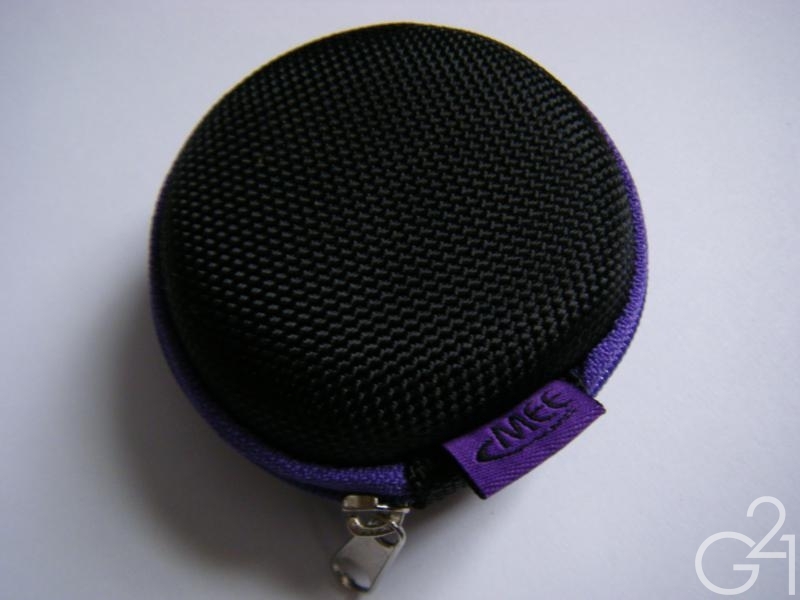 Second is a carrying case that differs from the standard offering quite significantly in that it is smaller, slightly more solid feeling and more pocket-friendly than the other version. 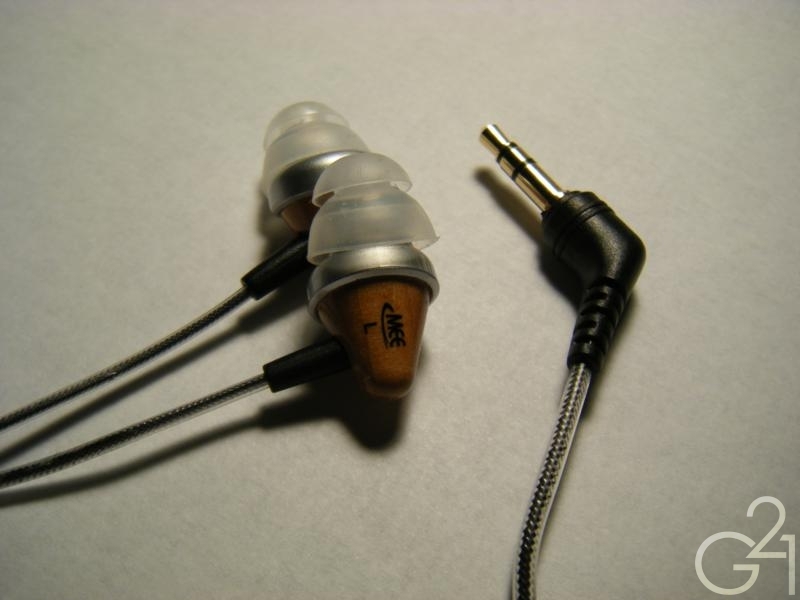 What’s interesting is that these are the only two IEMs in MEElectronics’ lineup that ship with this new carrying case. 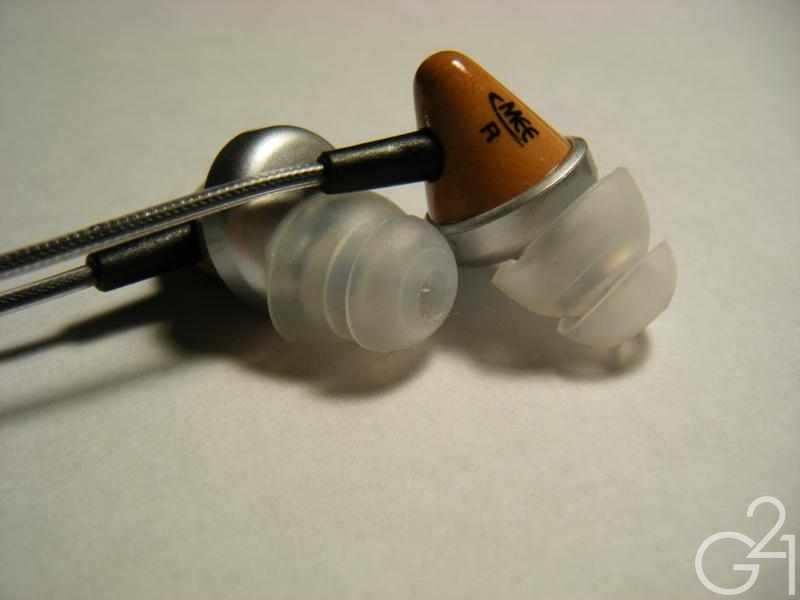 These IEMs are very small and feature a design similar to that of the Ultimate Ears Triple.Fi 10 Pro but are not nearly as big, bulky or prone to being uncomfortable. These are designed to be worn both cable up or down and are comfortable in either wearing style though the cable up design is more finicky in terms of fit and tended to chafe my inner ear a bit when going for deeper insertion with the stock single flanges. The included double flange tips made this a non-issue though. Isolation is very good with any of the included tips but I found the double flanges provide better isolation, as expected. 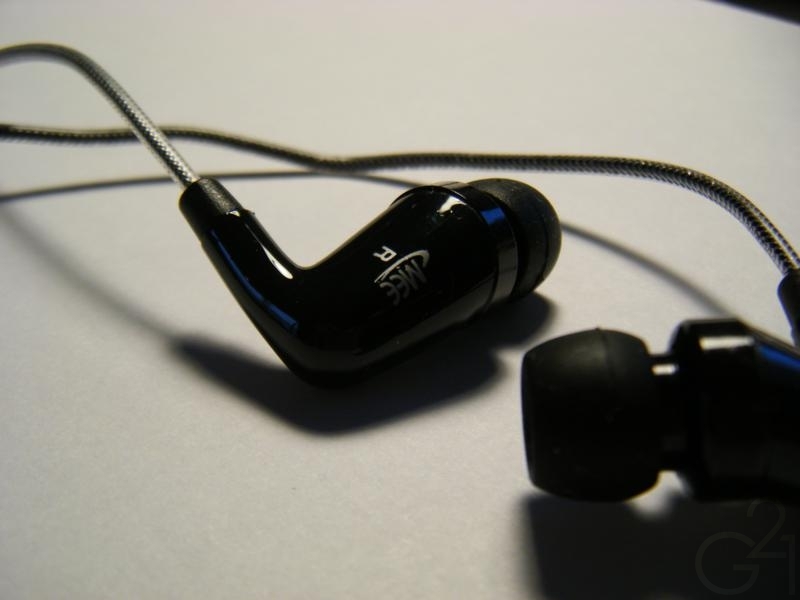 Microphonics are low when worn cable down and virtually non-existent when worn cable up. 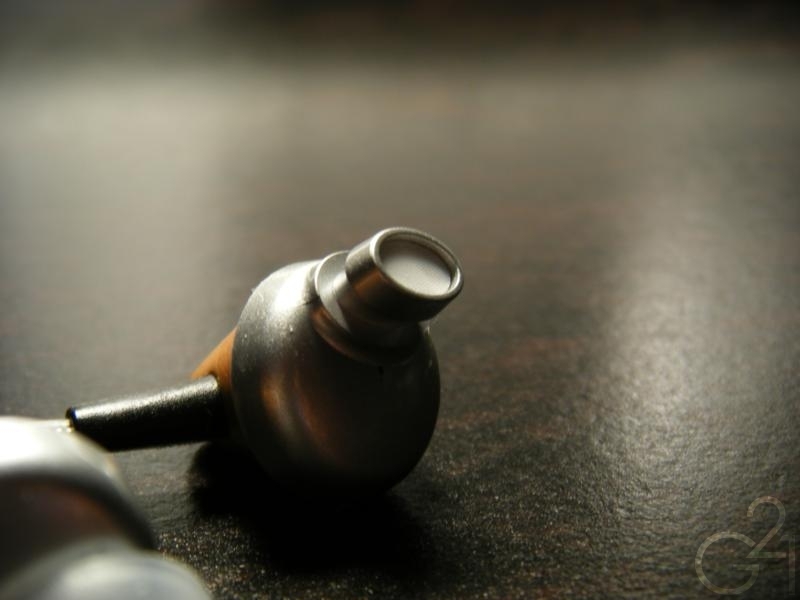 These IEMs are very comfortable to wear, featuring an angled nozzle ergonomic design that allows these to pretty much disappear in the wearer’s ears. Deep insertion levels as well as wearing them over the ear are not possible due to the angled nozzles but I’d say that tradeoff is worth it and deeper insertion as well as better isolation is attainable with the included double flanges or other triple flange tips. Microphonics are kept to a minimum, though they aren’t as low as with the CX21P. The housings of the CX21P are entirely made of plastic with mesh filters but have a nice, solid feeling to them. The downside is that they feature little in the way of strain reliefs, so extra care will need to be taken with these. The cable is great and is properly relieved at the end with a 45 degree angle L-plug. Strangely, contrary to previous MEElectronics models I’ve used, the CX21P has its microphone module installed on the left side of the cable rather than the right. This isn’t a problem but was worth noting. The housings are made primarily out of wood and feature plastic nozzles. 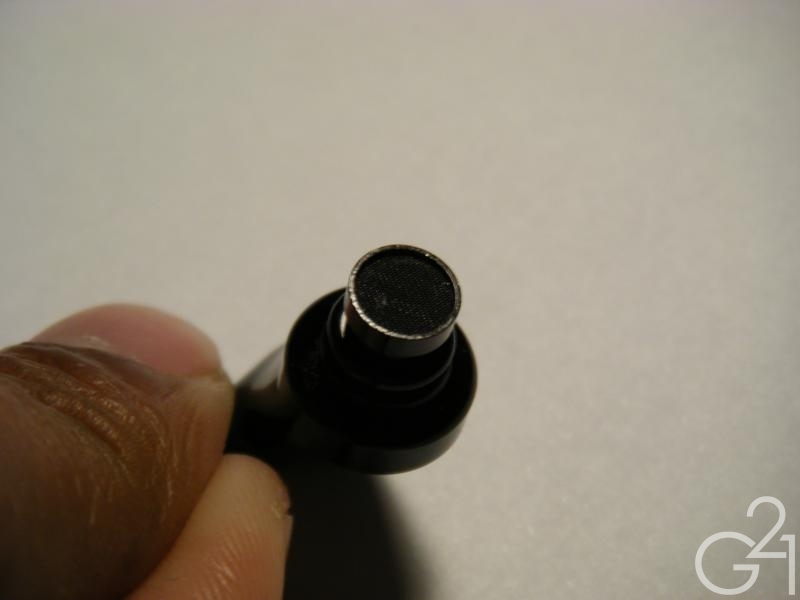 On that note, the CW31 features oval shaped nozzles, which I’ve never seen before on an earphone. This design is very peculiar but doesn’t limit them in terms of tip selection, at least based on my testing with standard silicone tips of varying nozzle sizes and Sony Hybrids. 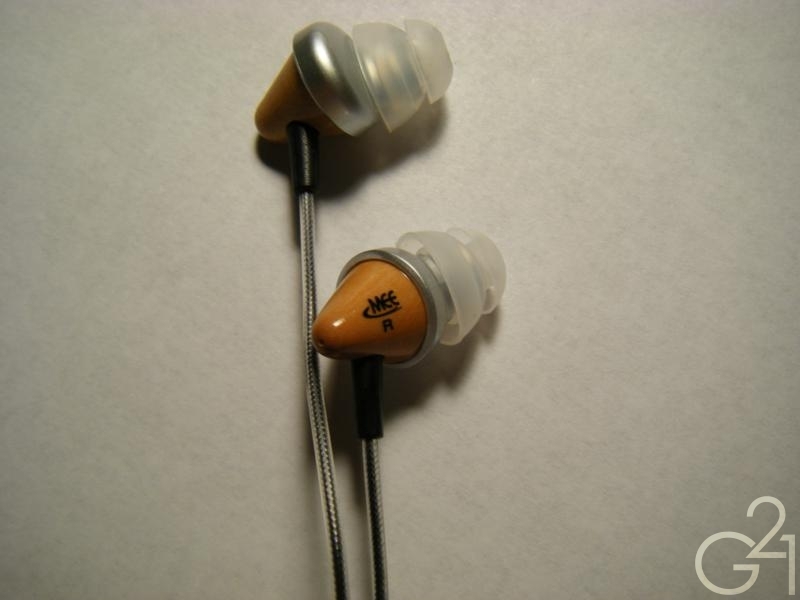 Back to the design, the earphones feature two vents, one at the rear of the housings and one, very tiny vent next to the nozzles. 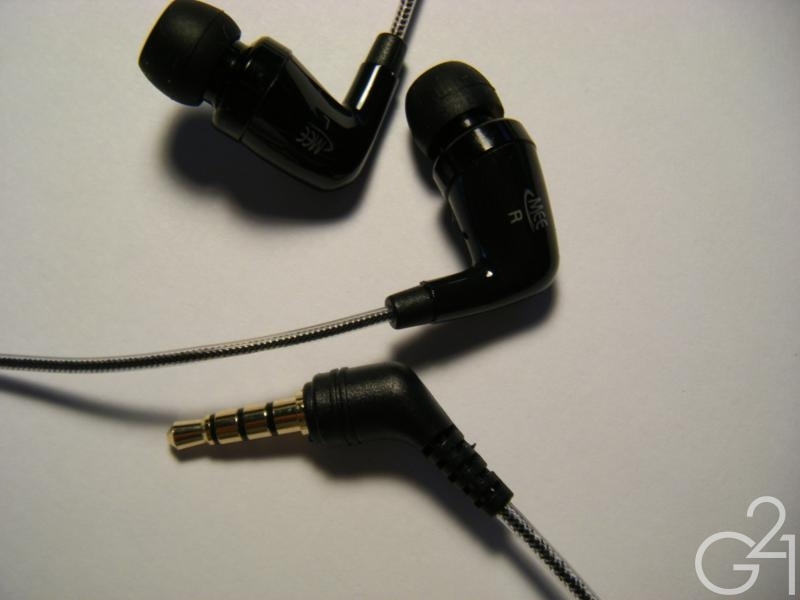 The cable is, like the CX21 and just about every other MEElectronics product, excellent and is well relieved at both ends and featuring a 45 degree L-plug identical to that of the CX21P. 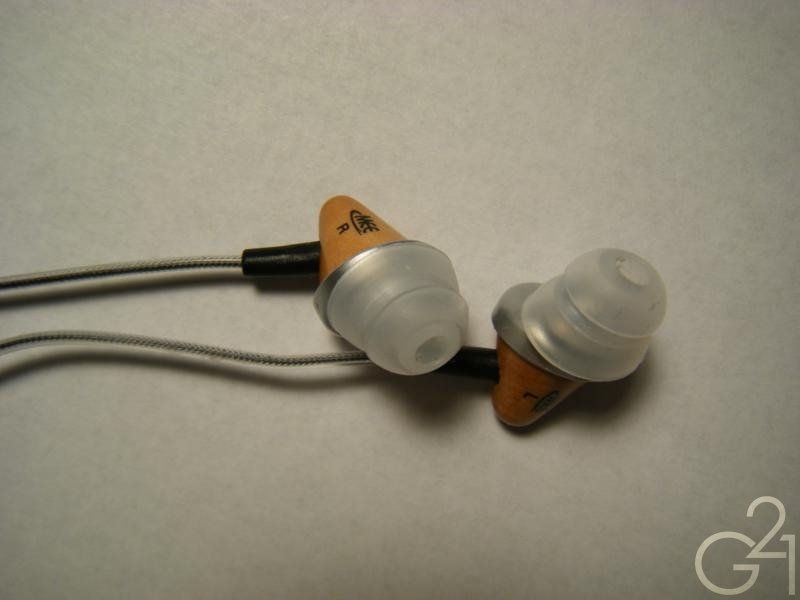 Burn-in: Both IEMs have been given upwards of 50 hours of burn in time prior to evaluation. 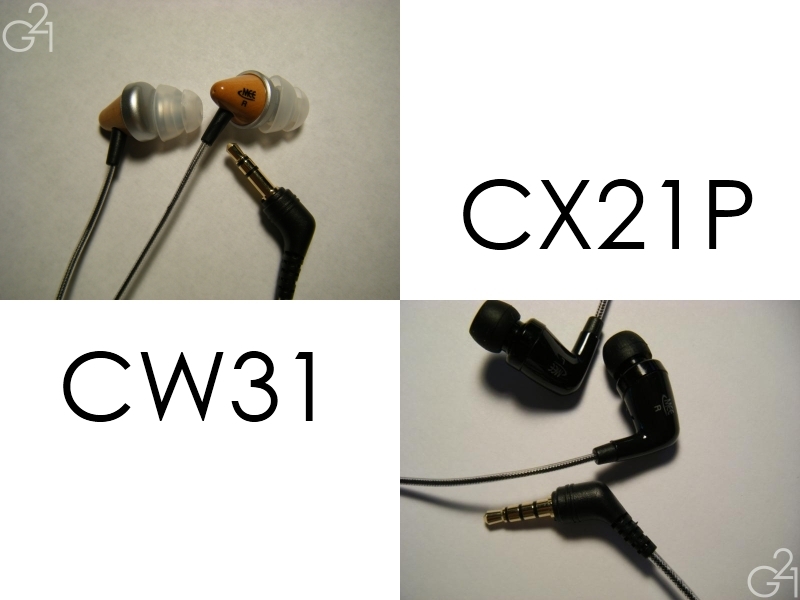 The CX21P are the leaner sounding of the two earphones with less bass emphasis and low end rumble but not by much. The presentation carries more air than the CW31 and its soundstage sounds slightly bigger because of it. Tonally, the CX21 is fairly neutral and somewhat analytical in character. The midrange is a bit lean sounding but doesn’t slouch in terms of detail and delivers an impressive amount considering their price point. Some unpleasant harshness is present in the upper midrange but not unbearably so. Treble extension is decent, extending about as high up as the CW31 but it isn’t as smooth and is a bit sibilant from time to time. A word on the built in microphone: The CX21P, like all models in MEElectronics’ P series features a built in microphone and single button remote which is designed for newer cellphones, smartphones and recent iDevices. The remote and microphone both performed as advertised on my LG EnV Touch cell phone and fourth generation iPod Touch, delivering clear voice quality to the recipients of my calls. This earphone has most of that familiar sound I’ve come to associate with wooden earphones, but is different in a couple of ways. Namely, the sound signature isn’t as warm as I expected and is mostly neutral in character and frequency response. The low end is accentuated, more so than the CX21P but not so much that I’d call it bass heavy in any respect. The midrange is nice and smooth, very slightly forward and linear with superior detail than the CX21P. The upper midrange is devoid of unpleasant harshness and treble response is similarly linear and rolls off gradually as you approach the top end. Presentation is decent, with good instrument separation throughout the soundstage which sounds very slightly cramped to my ears. Timbre sounds a bit more natural here than on the CX21P, which I’ve come to expect from midrange wooden earphones but may or not be primarily attributable to acoustic properties of the wooden housings themselves. The CX21P retails for $45 and the CW31 retails for $50 straight from MEElectronics’ online storefront. Once again, MEElectronics has produced a good value in these two IEMs but, honestly, aside from the slightly superior timbre and slightly more even sound, I didn’t find the CW31 to be that much better than the CX21P on a technical level. Considering that the CX21 and CX21P are both cheaper than the CW31 by a decent amount, I’d actually say they are the better buy, overall. That being said, I can’t imagine either one will disappoint at their respective price points considering their performance and the more discerning listener or enjoyer of slightly warmer, bassier sound signatures should be happier with the CW31 but, of course, you mileage may vary. All in all, I think MEElectronics has delivered a pair of highly competent performers in the $50 and under price bracket and I think mainstream listeners and detail freaks should find something to like in these two as they do a good job of bridging the gap between the clarity imparted by analytical sound signatures and more “fun” bass driven sounds. 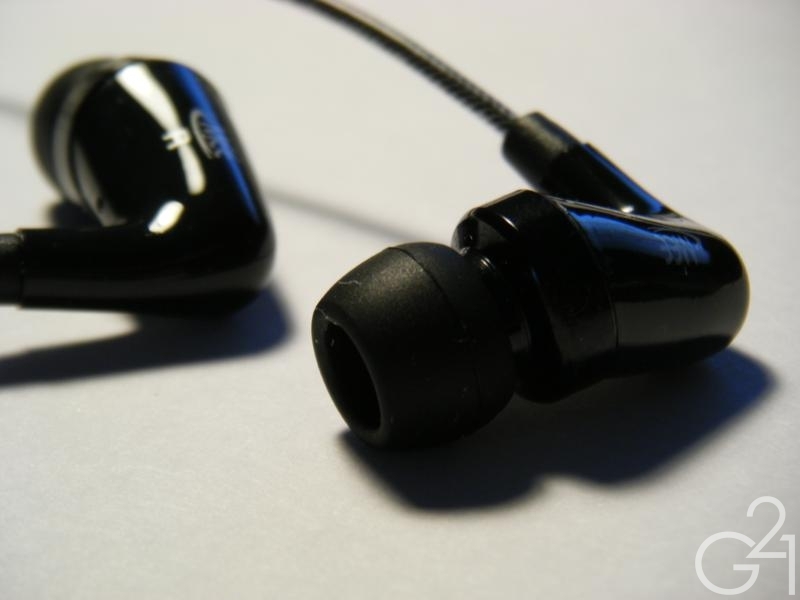 At their respective price points, the two earphones are a very good low to midrange (in terms of price, not performance) choice in an already crowded market and are a good alternative to the decidedly mainstream sound of MEElectronics’ own M-Series.